Driving drunk is always a bad idea, but as one Florida man found out Thursday night bringing your illegal exotic pet along for your intoxicated joy ride is a great way to make a bad situation significantly worse. When police in Largo, FL pulled over 36 year old Eugene Carl Kotelman for speeding early Thursday morning they discovered a small macaque monkey in the man's truck. They also discovered Kotelman was drunk and driving on a suspended license and subsequently arrested him—the Florida man had already faced both charges several times. 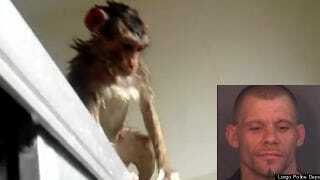 Initially police officers released the monkey—whose name is believed to be Doc Holliday—to a friend of Kotelman's. However, once Florida Fish and Wildlife Conservation Commission officers found out about the incident they quickly tracked down Kotelman and arrested him again, charging him with possession of wildlife and two counts of violating fish and wildlife rules. After the arrest the FFWCC took custody of the illegal monkey. If this story wasn't already weird enough, Peter Jamison of Tampabay.com reports that the Florida Fish and Wildlife Conservation Commission had been on the hunt for Kotelman and "his simian companion" for some time. Kotelman first drew attention from the FFWCC when he "flagged down a Pasco Sheriff's deputy earlier this month with a mysterious complaint that his pet monkey had escaped his vehicle and had vanished into the forest outside a Hess gas station". Kotelman is now believed to be the Youtube user who posted videos of several small monkeys kept as household pets under the user name "monkeysdaddyg". One of the videos is this one which shows a man driving down the highway in an F-350 while monkeys grab the steering wheel and play with a glow sticks. The FFWCC were also seeking the creator of these videos for the same charges of violation of wildlife-possession laws. The status of the other two monkeys in the videos—named Uncle Sam and Koty—is not currently known, but we wouldn't be the least bit surprised if they manage to do a better job avoiding capture by authorities than Kotelman.